Sit and relax by the wood burning stove, read a book, or simply enjoy the view. This is the first and original cabin built in the early 1950’s by the homesteader. This room has a rustic but very cozy cabin feel and is decorated with things that were part of Joe’s lifestyle. Guests enjoy the solitude while relaxing and enjoying reading a good book in this special room. We offer a small selection of Alaska readings which you are invited to browse and enjoy the view. Every meal at the Alaska Homestead Lodge is hand prepared from scratch. Enjoy freshly picked produce from our garden and greenhouse, delicious entrees and homemade breads and desserts. Enjoy relaxing in this great space, watching movies, playing games or reading while having a cup of coffee or tea. Enjoy this roomy upstairs loft with private balcony, which offers a beautiful view of the Cook Inlet. This room includes (3) twin beds or (1) king bed and (1) twin bed and a full bathroom. You will feel right at home in this cozy room with two reclining chairs while relaxing or reading a book. Note: This room has a ladder style steps going up to the loft. This room offers a beautiful view of the garden and has a queen size bed and 3/4 bathroom inside the room. 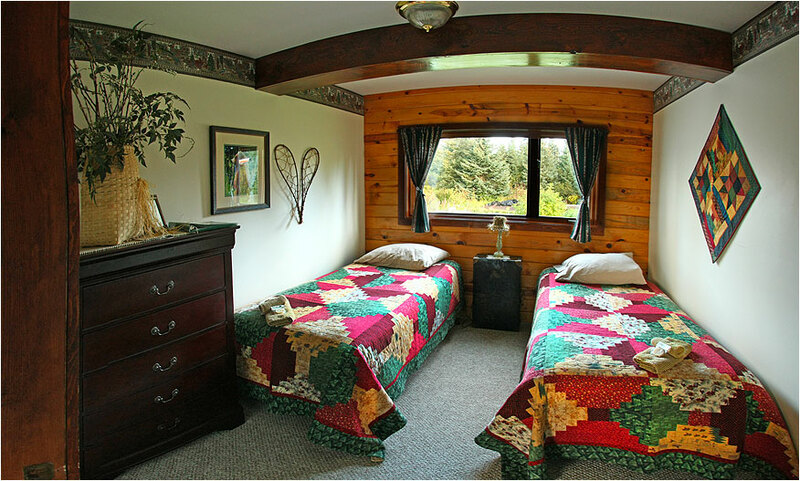 The furniture has been carved out of birch wood by a local Alaskan and the bed is draped with a beautiful handmade quilt. This is a smaller room, but very cozy with a great garden view and has two twin beds or one king bed with an exclusive full bathroom right outside this room. This is a wonderful log-styled room with a decorative fireplace built by the original homesteader. This room offers a spectacular view of the garden, the Cook Inlet and tidal flats, where the bears roam. 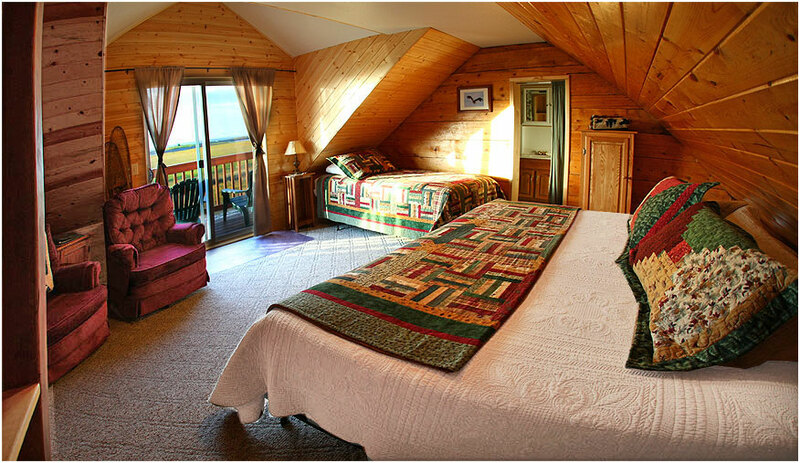 This room has a log styled, queen size bed and a full bathroom in the room. This spacious upstairs suite has a vaulted ceiling, two twin beds or one king bed with a view of the local mountains, backyard and garden. This suite includes a table and chairs, dresser and has a spacious deck with comfortable lounge chairs. This room has a shared full bathroom with the Seaside Suite. This spacious upstairs room is a newer addition to the Homestead, and has a vaulted ceiling, two twin beds or we can convert them to one king bed. It has a sitting area overlooking the tidal flats and Cook Inlet. This room is decorated with seascape décor and has a full bathroom that is shared with the Mountain View Suite. This is a great set up for couples or singles traveling together, and/or a family. This wilderness themed room is beautifully decorated and has a queen bed, full bathroom, double rocker and antique desk and dresser. This room is on the main floor of the new addition and has an outside deck and seating to view the backyard and garden. Click on the photos above for details.